A grant of 38 million from the VILLUM FOUNDATION paves the way for a brand new professorship at the Niels Bohr Institute for world-leading researcher in the field of quantum physics, Professor Charles Marcus. The world-leading researcher in the field of quantum physics, Professor Charles Marcus receives a grant of 38 million from the VILLUM FOUNDATION for a brand new professorship at the Niels Bohr Institute. 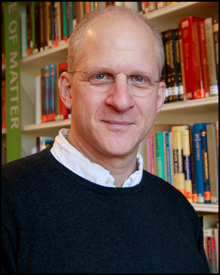 Charles Marcus is coming from a position as a professor at Harvard University in the USA. After a lot of spadework to find and attract a physicist of international standing the Niels Bohr Institute can now look forward to receiving a grant of 38 million DKK from the VILLUM FOUNDATION. The grant has allowed for the creation of a permanent position for the world-leading researcher in the field of quantum electronics, Professor Charles Marcus. Charles Marcus is coming from a position as a professor at one of the world’s leading universities, Harvard University in the USA. The grant represents the first instance in Denmark where a private foundation is financing the creation of a permanent professorship – known in the English-speaking university world as 'endowed chairs'. “This is a great new opportunity that the VILLUM FOUNDATION is demonstrating. This generous donation from the foundation represents a new way to attract exceptionally talented researchers to Danish universities by guaranteeing researchers permanent and attractive employment conditions,” says Professor John Renner Hansen, Head of the Niels Bohr Institute. When the institute contacted Professor Marcus to offer him the new Villum Kann Rasmussen Professorship with the huge grant in hand, he was not difficult to persuade. A few years ago, Professor Marcus had a very successful guest stay at the Niels Bohr Institute, so he was very familiar with the institute and its international research environment. The ability to hire a researcher of Professor Marcus’ international rank paved the way in late 2011 to attract funds for a new centre from the Danish National Research Foundation, the 'Center for Quantum Devices', under the leadership of Professor Marcus. “I am proud to be able to accept the Villum Kann Rasmussen Professorship and am impressed to see how a private foundation like the VILLUM FOUNDATION and the Danish National Research Foundation have joined forces to provide the Niels Bohr Institute with the economic resources that make it possible to deliver research at the level I promised them with my appointment,” says Professor Charles Marcus, who has just taken up the professorship. The research aims to use advanced materials to develop nanoelectronics comprised of semiconducting nanowires, carbon nanotubes and superconducting systems and to develop new measurement methods. 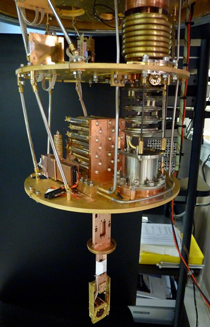 The experiments are carried out at ultra low temperatures close to absolute zero, which is minus 273 degrees C.
Charles Marcus and his centre will also conduct research in quantum information with systems based on electricity, that is to say, electrons instead of quantum optics that are based on photons. Charles Marcus believes that in the future these two fields – quantum electronics and quantum optics, will develop in an interdisciplinary fashion, and he expects a great deal from future research, which he believes will soon be part of an entirely new field, Quantum Science. “We have long wanted to test this model as a potentially new mechanism to significantly strengthen Danish research environments that have the ability to make full use of internationally recognized researchers of an exceptional level, which Charles Marcus clearly represents, in their research and teaching. And we are both confident and proud that this model will be tested for the first time in Denmark in a research environment at the Niels Bohr Institute, says Director for the VILLUM FOUNDATION, Kjeld Juel Petersen. With the grant from the Villum Foundation of 30 million DKK, Charles Marcus has been appointed as the Villum Kann Rasmussen Professor at the Niels Bohr Institute. The professorship also comes with a grant for 5 postdoc positions and a guest residence.